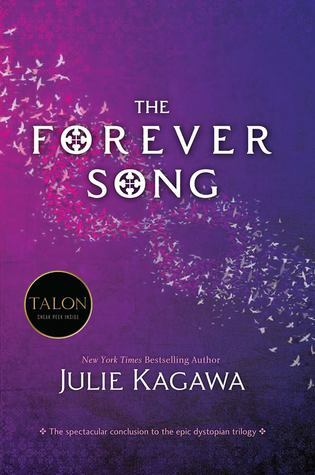 One wouldn’t think a book whose primary theme is family would be about killer vampires, but one would be wrong because with “The Forever Song,” Julie Kagawa finishes her epic Blood of Eden trilogy with a novel focused on family. If you read “The Eternity Cure,” you know that Allie, Jackal and Kanin make a good team, but in this novel, you get to experience them interact as a “family”. And OMG is it hilarious! Allie and Jackal are the typical big brother and kid sister who love to hate each other, with Jackal getting some good zings in. And poor Kanin is the exhausted parent on the family road trip who puts up with the kid’s shenanigans until a certain point and then threatens “Do you want me to pull over” to calm everyone down. I loved the fact that despite being ferocious killers, Kagawa really humanizes the three with this familial , especially Jackal and Kanin, so by the end, the three of them are really a picture of a functional family. Of course The Forever Song, being a novel with vampires and dealing with a crazy vampire such as Sarren, has “happy” times are equally punctuated by events that just hurt. I can’t go into detail without giving spoilers, but I can say there were a few moments in the novel where my heart broke. There were also a few times where I thought, “Should I really be eating while I’m reading this?” Kagawa does not insult her readers by holding back on descriptions of violence and I respect that quality of hers. The world that Allie lives in is desolate and dangerous with the struggle to survive in a land filled with raiders, psychotic vampires and rabids. Lastly, one theme I really enjoyed throughout this book, and the series, is the concept of being human. Kagawa truly explores this concept by having Allie deal with the loss of Zeke, her link to humanity, and her struggle to maintain the monster she knows lurks beneath the surface. The questions that Allie ponders, and is challenged by Jackal, and encouraged by Kanin, really give a balance to the deep philosophical questions most of us would have if we were facing the end of our known world. I’m sad that the Blood of Eden trilogy has come to an end because I greatly enjoyed the world that Kagawa created and being inside Allie’s head for a short time. While the novel ends in such a way that the story is finished, there is room for more. Ms. Kagawa, I’m not quite ready to leave Allie behind; is there a chance we’ll ever visit her again? Please? Recommendation: You better go buy this book on April 15!